I was on my way to a soccer game. Intramurals, playing on a team of high schoolers against another team of high schoolers. I already had my ankles wrapped, because my achilles are always sore. I had my water bottle, my smoothie bottle, and my homemade gatorade/protein mix bottle. I always bring extra shirts and socks, just in case. I was not as early as I’d hoped, but on time-ish. For me. Kim and I have our “date afternoon” on Thursdays, but it was an extra-hectic day because I had a skype meeting with my ministry that ran from 11:30-1:30. That left less than an hour for us to be together, which barely qualifies as a date. But I tried to squeeze as much as I could out of it. I remember pulling out of our driveway and saying “bye” to Kim. I think I remember the drive on the residential roads out, though I do that drive so many times I may just have lumped them together. I think I remember putting on my seatbelt. A motorcycle was stopped at the corner, waiting to turn. Motorcycle drivers tend to turn aggressively, and drive aggressively in general. That’s a generalization, but we see it all the time, an average of ten motorcycle riders die each day in Managua alone, and just the day before Kim had passed a crash between a van and a motorcycle in which the motorcycle rider died. But this rider was more cautious. He took a lot longer to make the left turn. I was watching him, watching the traffic, drinking my smoothie, trying to hydrate for the game. A bus pulled up. It was moving very slowly. Usually, buses pull up and stop to the right of our road, meaning they block our view of traffic coming from the right. But for some reason, this one stopped in front of the Petropolis, the little business center just to the left of our turn. Sometimes we pull through that parking lot and make our left out of there. I thought about doing that this time, but since it was only a motorcycle, I figured we wouldn’t be backed up at our corner. The bus slowed and slowed and seemed to stop right there, blocking their driveway. Not unusual. So I inched out, trying to get a view around the bus, checking back right to see if there was a space to get across and make my left turn. Cars were coming steadily, but I saw an opening. I looked back right once more to make sure, saw a car coming but decided there was time to get across without making it slow down, then went. I came to, as if swimming up out of a dream, sitting in the front passenger seat of our friend Joni’s truck, facing the opposite way from when I had turned. Why was I facing the other way? Joni was in the driver’s seat. Joni’s baby was behind me in the carseat. A white Toyota Prado ran into our van. It spun my around about 250 degrees and knocked me 40-50 feet, so that I ended up with my front wheel over the sidewalk facing the opposite direction. If you look at the picture, the Claro business is on the corner to the right of where I was turning, and I was a ways away from it, going left. I don’t remember the collision. I don’t remember the sound. I don’t remember seeing the white Prado, period. He found me unconscious. I don’t remember any of this, but somehow he laid the driver’s seat back and was able to get me out the back driver’s side door, because my door was crushed in. The window shattered and I was covered with glass, though I have only a collection of cuts on my left bicep. The only other cut I have is on my left lat. Why? My smoothie must have exploded. I had dried smoothie in my leg hair as I sat in Josh and Joni’s truck. I was still picking glass off my shirt and out of my arm. Apparently–and I have no reason to disbelieve this and no memory to contest it–I told Josh that I didn’t need medical attention. “Nah, I’m doing okay,” or something along those lines. Great to know that when autopilot kicks in, it says exactly the wrong things. Josh could tell I had some memory problems, because I kept asking the same questions, five or six times. My brain, whatever part was conscious, was trying to put the pieces together. What happened? Why were we there? What about our game? Josh was heroic. He dealt with the police and the driver of the other vehicle. I remember almost nothing of that time, but I do have a few glimmers of memory. One of them is a police officer talking to me in Spanish and Josh telling him, “he doesn’t speak Spanish.” Even in that state, apparently I could see that wasn’t the time to argue. A man kept walking around, talking on his phone, never coming close but often looking at me, first from one place, then another. That was the other driver. The police wanted me to sign something. I don’t know what it said. I didn’t know what was happening. I asked Josh, and he said it was okay. So Kim grabbed the first clothes at hand, which happened to be a t-shirt that said, “Pow!” old Batman style. Get the irony? Joni brought Kim and she talked to me, but I don’t remember that, either. In Nicaragua, you can’t leave the scene until the police release you to. I know in emergency situations, the ambulance will take crash victims right away (that saved my friend Alfredo’s life after his motorcycle accident), but in this case, I had to finish “answering questions” before I could go. But Josh convinced them to let him go to the police station for me, since he saw everything and I knew nothing, so that Joni could take me to the hospital. Up until we drove away from the accident site, I didn’t really have much awareness of how I felt. I’m sure people were asking me, but I had only just come back to consciousness. “Waking up” felt like all these noises and movements were swirling all around me and suddenly it came into focus and made sense and I was there. I went from not knowing and none of it seeming real to “we’re going to the hospital now.” And that’s when I realized how much it hurt. I couldn’t shift positions or move my left arm without pain in my back and midsection. I could only breathe very shallowly and I couldn’t laugh or cough or let my breath run out. I had a large bump on the right side of my head, what my dad would have called “a good-sized goose egg.” I was trying to figure out how badly I was hurt while the pieces of what had just happened were finally falling into place. We got to the ER of Metripolitano. This is the best hospital in Nicaragua; they provide top level care. Some things are done differently than we are used to, though. They glanced at the cuts on my arm when I first arrived and never looked at them again. They didn’t check to see if I was cut anywhere else, or if I still had glass in those cuts, or clean those cuts. The doctor examined me and ordered scans on my brain and on my back. I’ve had x-rays but I’d never had an MRI before. Here was the problem: I couldn’t lie down without pain. When they tried to have me lie down on the ER bed, I started to spurt Spanish (sometimes I speak it) about how that was very uncomfortable, so they propped me up in a sitting position. Much better. Word was getting around that I’d had an accident. Two of our daughters were playing in the IM soccer games, and they heard while on the field that something happened to their dad. So Kim got through to someone who could put our youngest daughter on, and I asked about her game and my game and told her how ripped off I felt not getting to play, and What?! We got beat by that team? Then I told her I loved her and we said goodbye. And I went back to breathing shallow and whispering. They put an IV in me with pain medication, and about three minutes later we were heading for radiology. But when we got my gurney next to the MRI, they just said, “You need to lay down in there.” Two hospital attendants kind of lifted the sheet and helped move me from the gurney to the MRI surface. And that was the point at which I suddenly got scared. I wasn’t conscious for any of the scary parts of the accident, the collision or the spin, the boom or the shattering glass. Now, trying to find a way to wriggle into a position in which I was lying flat on my back that didn’t cause me to scream, it hit me that I might have a serious back injury. I don’t know how much I prayed throughout this adventure–even when I thought my head was clear, half an hour later it was clearer and I knew it hadn’t been before–but I prayed then. What if I couldn’t run again? What if I couldn’t ever run again? And I was just this side of losing my dignity completely and howling from the pain while I tried to get in the position they wanted. Later, someone asked me, “Did they immobilize you?” Uh, no. No, they didn’t. They took lots of pictures. Pictures of my brain, pictures of my shoulders and spine and pelvis. Then we were done and trying to get me back on the gurney, and that was barely any more fun than getting me off of it. We rolled back to Kim. And we waited. Not a terribly long time, honestly, but again, time was kind of stretching and contracting. I still had smoothie on my leg. My head didn’t hurt, but my back did. We tried to ask if they expected to keep me overnight. Mercifully, they had brought me back to an exam room, which was much more private than the ER room I’d been in before, where a small child and a young woman were both suffering a lot of pain. The doctor came back in with two huge envelopes, and he started pulling up rows of images of my head, one after another. He was across the room and speaking in rapid Spanish, but I got “No internal bleeding, no swelling inside, no permanent damge.” Breathe. Breathe. Then we moved to the back images. I found this harder to track, but once I figured out the word for “rib”–costilla–it all made a lot more sense. My top left rib in back was fractured. 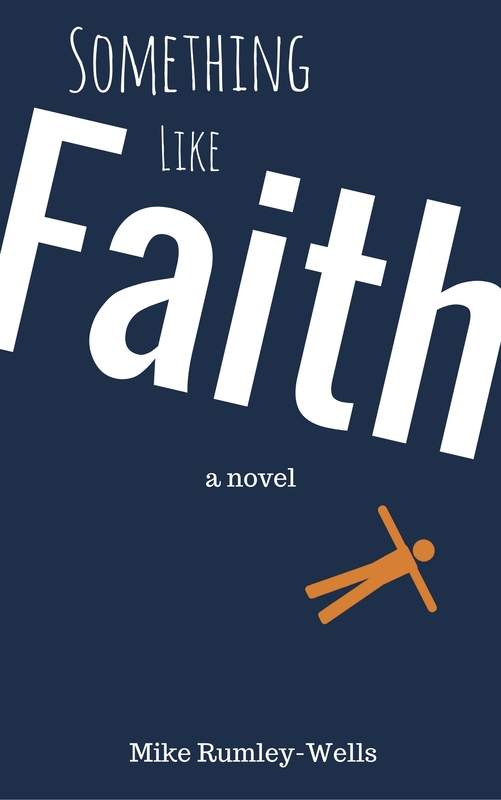 It was pushing up against my lung, which explained all those moments of flashing pain. No injuries to vertebrae. No evidence of any problems with my back. 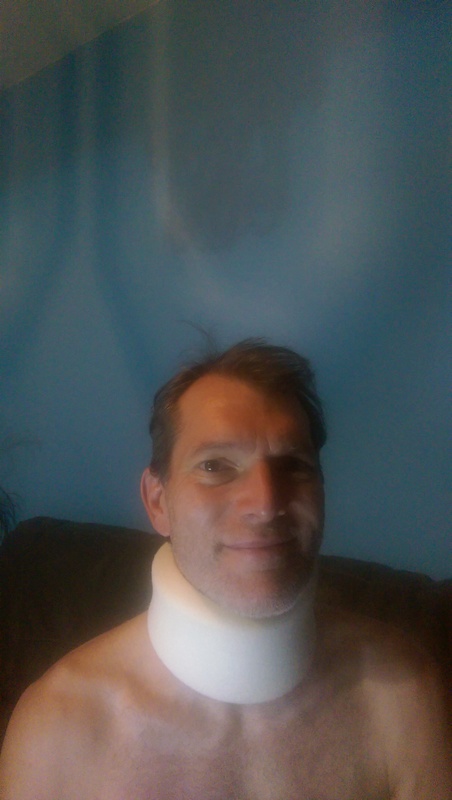 Very likely to have whiplash, so I would have to wear a collar (of shame) for two weeks. I needed to restrict my activity for four weeks to let the rib heal back together again. And then we were talking pain and anti-inflammatory medications, putting a neck brace on me, and they were going to get the paperwork to release me. I think we spent about 4 hours in the hospital. They didn’t bring a wheelchair, though I would have gladly taken them up on the offer. Kim sent a text and very soon, our friend Dave was pulling in to rescue us. A few things to add: our car has only liability insurance. It is likely done for. It was not tow-able, and I think our insurance company laughed, literally or figuratively, when we asked about their sending a tow truck. Josh had called Dave to help with the car, since Josh was dealing with the police. They tried to hook it up to his truck to tow it, but with the wheel and (likely) frame damage, that wasn’t happening. Dave called about a tow truck but it was going to cost 4000 cords ($150). No, no AAA. Then a huge, flat-bed tow truck pulled up, looking for the car it was supposed to tow. Not ours, mind you. But the driver spent five minutes looking for the car he was there for, then shrugged and said, “800 cordobas?” ($28.50). “Sold!” Dave said. While we didn’t get some of the bells and whistles (antiseptic for my cuts, wheelchair for my exit), the total cost for the 4 hours of medical care including the use and reading of their MRI was $750, out the door. Yes, straight out of pocket, but still, not breaking the bank. We can’t afford a new car right now. 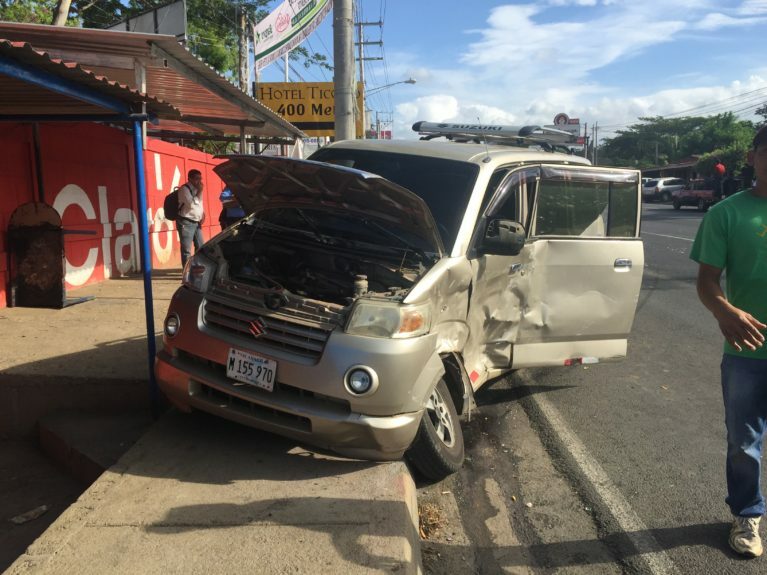 In Nicaragua, it is astounding what they can patch together and put back on the road, but that doesn’t mean our van would be safe to drive again. I don’t know how we’re going to work this out, financially. BUT, two dear friends who co-own a car that they make available for short-term missions folks to rent immediately offered for us to use this car, for free. So we have a functioning (and nicer, frankly) vehicle sitting in our driveway as I type this. Karel, one of the other International Christian Fellowship elders came over to pray with us (Dave and I are also elders), along with two guys on my basketball team, so that when we got back home, we were having a small party. You might think that would not be desirable, but by that time, some of the meds were really doing their job, and I think it was great for our kids to see how community was rallying around us, and have my homecoming be more light-hearted, since the day had been sufficiently traumatic already. Karel also arrived with a lasagna sent by Lisa, which became tonight’s dinner. My back hurts a lot. Besides the broken rib, I think all the muscles from my chin down to my waist got wrenched and are still trying to release again. It’s hard to find a comfortable, sustainable position in which to sleep. So far, my neck does not hurt much and isn’t that stiff. I’m trying to be very cautious and wear my brace. My head seems fine, which is to say, I don’t think my brain is any worse than it was when I pulled out to turn left. I’m grateful to be alive, pure and simple. I think, had I not worn my seatbelt, that collision could have paralyzed me, caused a head injury that caused brain damage, or killed me. I got knocked out with my seatbelt on. I feel like I got off pretty easy with a broken rib, concussion, bruises, cuts and whiplash. I don’t know what happened. I don’t know if the other driver was coming extremely fast and whipped around the bus at the last moment or if he was coming in my lane the whole time and I simply missed him or miscalculated. I’ve tried and I can’t produce any memory or image of that moment. It’s gone. But when Dave looked at the van on the scene, he imagined a very different, much more limited life for me from then on. When I look at the picture, and go back to the moment when I came back to myself, I see how fortunate I am still to be here to be dad to my children. I suspect if I had gotten less badly injured, I might be tempted to think, “Why me? Why did this have to happen?” My soccer team lost 1-0 and I might have made a difference. My rib likely will take a month to heal. But I don’t feel hassled or inconvenienced. Being slammed into by a Toyota Prado going who knows how fast reminded me what is, and is not, important in my life. It restored my perspective, instantly. I don’t care if that sounds clichéd, it doesn’t matter as long as I respond correctly. I hugged each of my children (“Gently!”). I told a bunch of people that I love them today. I made a point of expressing my gratitude. I inched my way out of bed and limped to my Bible class this afternoon so I could let them know how much I enjoy being their teacher–then got a ride back home and passed out again. I told Kim as we were going to sleep last night that I’m really glad to be alive still and married to her. I’ve seen too much death to think it always comes with a reasonable explanation. It doesn’t. I spoke at a memorial once for a young couple who were driving in Colorado when a huge rock hit their car and they both died instantly. They didn’t do anything wrong. It was just timing, like mine was timing. If I had done any of 1,000 things differently, I would not have been in that moment at that time. But I was, with my seatbelt on, and I’m still here to type about it, and to try to love people like Jesus did again tomorrow. “Though I found him unconscious he has made a fast recovery and is back home with his family with nothing but a broken rib and some cuts and bruises. “Thankfully.” Josh is exactly right. I go to bed now thankfully. And the fact that I will wake up tomorrow morning? For this, for all of this, I am thankful to God. I’m glad you’re in one piece Mike. Healing at our age takes a lot longer than it did in HS. You will be back to your active self before you know it. Me, too, Troy. Thanks. Yeah, you’ve walked this road. Let me know if you have suggestions on rehabbing at our age. Wow, Mike! We are in the states and had no idea until we read this. Praying for your healing and provision for a vehicle. We love ya man! Surprise! All the excitement happens when you’re gone. Thanks for your prayers, we certainly need them. Love you both! Thank God you are alive & able to write such a detailed and reflective account. Blessings for a full recovery. I am so glad it was not worse than it was. Praying for your full recovery! We never know what the day will bring. God is in charge of our day not us. Thank goodness he was there with you. Rest and heal my friend. Prayers for healing and comfort during this time. Thanks, Evelyn. I appreciate all those prayers. It’s a huge reminder, when we think we’re going about this busy life that we control and that we are always in charge…and then get reminded we’re not. So glad you are alive! You whipped it good! So glad you’re okay – we love you! Thanks, Bev! I’m very glad and grateful. Love you two, too! Shut the front door! Jeepers Mikey-Mike. Love coming to your blog, but dang!! Thank God your radically ridiculous life continues. Peace and Love Mikey-Mike.